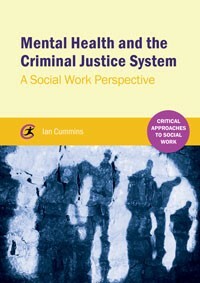 In this post, Ian Cummins (pictured below), introduces his new book Mental Health and the Criminal Justice System: A social work perspective. The book was published in March 2016 by Critical Publishing. I am a Senior Lecturer in Social Work based at Salford University. 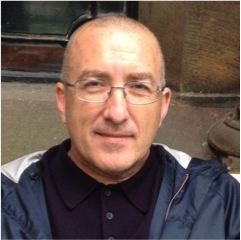 I trained as a probation officer and worked as a mental health social worker in Manchester before taking up academic posts. My main research revolves around the experiences of people with mental health problems in the criminal justice system. This includes all areas of the criminal justice system but I have focused on policing and mental illness. I argue the criminal justice system has become, in many incidences, the default provider of mental health care. These issues are examined in my new book. The book essentially explores the interaction between two of the most significant social policy developments of the past forty years - deinstitutionalisation (or the closure of large psychiatric institutions) and mass incarceration (or the expansion of the use of imprisonment). The failure to develop properly resourced community mental health systems has seen the de facto criminalisation of the severely mentally ill and the abandonment of a social state sense to support some of most vulnerable members of society. The book explores the way that mental illness can be a factor in a decision making across the criminal justice system, from interactions between police officers and citizens on the street to decisions about the appropriate sentences for those who are mentally ill but convicted of offences. My approach is influenced by Wacquant’s analysis of processes of advanced marginality. In particular, I see both the failure of community care and the development of mass incarceration as part of the wider neo-liberal political project’s shift towards more punitive responses to social problems. I argue that these developments are tied to the trope of individualism that is at the heart of neo-liberal political ideas. My analysis of the development of mental health policy has applied Jonathan Simon’s notion of “Governing through Crime” to the history of community care. This approach helps to explain why mental health policy became so politicised from the mid 1980s onwards. The roots of the current crisis in mental health and criminal justice system policy lie in the populist policies of that period - three strikes and you’re out (in the USA) and prison works (in the UK). The failures of community care policies have led to more people with mental health problems being drawn into the criminal justice system. This is not only unjust but puts their health at greater risk. I conclude that the current fiscal retrenchment of the state provides an opportunity to challenge fundamental assumptions about the criminal justice system. The use of imprisonment has to be reduced and that the only way to do this is by rediscovering the principle of dignity. All those caught up in the criminal justice system are our fellow citizens. If we start from acknowledging this fundamental point then we would devise completely different responses to both mental health crises and offending. Is Unrealistic Optimism an Adaptation?